It's a big week for LCD-less WiFi point-and-shoots, but today's offering is a bit more unusual than Sony's lens-camera duo. 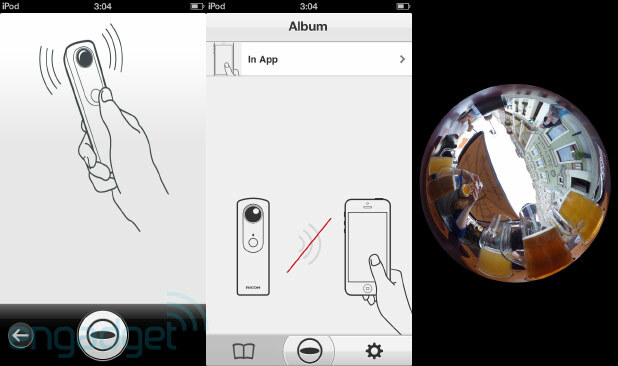 What would you pay for a 360-degree camera that's compact, easy to use and compatible with an iOS app? $100? Maybe a buck fifty? Ricoh's betting big on a figure far higher -- a "consumer-friendly" $399. And we're not sold. Sure, the Theta is a unique device, but 360-degree images have limited appeal, and the fact that you (and your friends) will need to download a dedicated app just to view them without distortion doesn't help to seal the deal. Still, we're always up for trying out something new, and we're guessing you might be a bit curious, too. Click past the break as we go full circle with Theta. Ricoh's new cam is small enough to fit in a pocket, or you can carry it in the bundled pouch that includes a belt loop, should you need to fill the void left by your pre-BB10 BlackBerry holster's retirement. Theta includes two opposed hemispherical lenses, letting you capture a full 360-degree image in a single frame. The camera itself excludes a display or any manual settings at all, but given the super-wide angle you're shooting at here, there's not much framing to be done. You can either capture images to the internal memory or to an iOS device connected via the ad-hoc WiFi network (Android support is coming later this year). If you're linked to a smartphone or tablet, you can use the device as a remote shutter release, which we'd definitely recommend -- with a lens on both sides, there's no way to hold the camera without several appendages ending up in each shot. Our sample images were all captured with a fixed aperture of f/2.1, shutter speeds ranging from 1/20 to 1/125 of a second and a sensitivity that jumped between ISO 100 and 800, depending on shooting conditions. Images shot at ISO 800 are incredibly noisy, so Theta is clearly best suited for use outdoors or in a bright room. The photos we captured were each a hair over 6.4 megapixels, but as you'll likely be reviewing shots on a phone or tablet, you'll be looking at a scaled-down version, though you can pinch or double-tap to zoom in. We tested the device with an iPod touch that came pre-installed with the Theta app. The process of pairing the camera and iPod each time takes several seconds to complete, so you'll want to leave both gadgets powered on whenever possible to avoid delays. Controls are also quite limited, so you won't be adjusting the ISO or shutter speed manually to achieve a certain effect. Really all you can do here is capture an image remotely and transfer it to the device for storage or sharing. That simplicity does help minimize impacting the battery, though, and we had no problem getting through a full day on a single charge. Considering that you'll likely struggle to identify even a dozen moments that call for a 360-degree photo each day, you should be in very good shape power-wise. Once you're done, plug Theta into your computer using the bundled micro-USB cable to charge it up as you download shots -- each image will appear just like those above and below. What you do from there is up to you, but if you're like us, you might consider boxing this thing back up and shipping it off in exchange for a refund. Those 400 bucks could be put to better use. Tokyo and Berlin, 5 September 2013, Ricoh Company, Ltd. announced today the launch of the RICOH THETA, the world's first mass-produced imaging device that encapsulates fully spherical scenes with one shot. The handheld device, to be sold at a base price of USD 399, will be available for preorder this month in France, Germany, the UK and the US at theta360.com. Developed and manufactured by Ricoh, the device will be marketed by subsidiary Ricoh Imaging Company, Ltd. through its French, German, UK and US online-exclusive sales channels starting October. 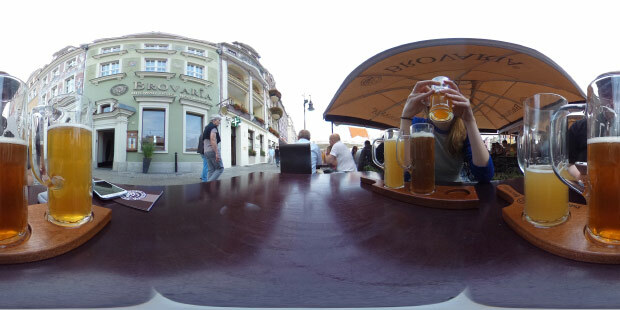 The RICOH THETA features a proprietary ultra-small twin-lens folded optical system that captures the scene around, above and below the device in one shot for unprecedented, fully spherical images. Fitting easily in a pocket or the palm of a hand, the slim, lightweight (95-gram) RICOH THETA is a go-anywhere device suited to confined spaces, the great outdoors and everywhere in between. The device is synchronized with smartphones, where images can be immediately transmitted via Wi-Fi® and viewed with a dedicated free app. The app also allows images to be pinched, swiped or rotated to edit size, shape and composition. 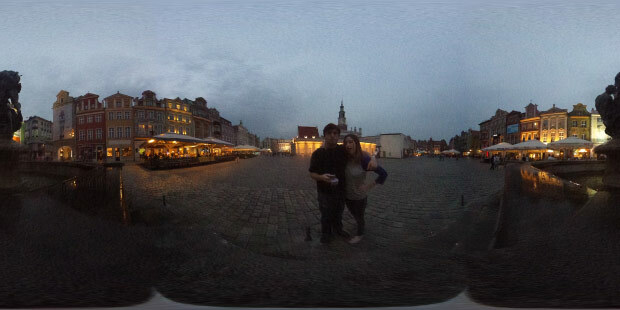 Images uploaded to theta360.com can be shared on social networks such as Facebook™, Twitter™ and Tumblr, as well as Microsoft®'s Photosynth®. At launch, the RICOH THETA will be compatible with the iPhone 4S and iPhone 5 running on iOS™ 6.0 or above, supported by RICOH THETA for iPhone, a free iOS app available at App StoreSM. Android™ compatibility is expected before the end of the year. "The RICOH THETA enables people to capture, explore and share their creativity and new visions of life," said Wataru Ohtani, associate director of Ricoh's New Business Development Center. "By encapsulating everything and everybody within a cohesive sphere in one simple shot, it will help users to perceive the interconnections that we all share. The RICOH THETA connects users with their own cognitive and non-cognitive senses, and ultimately with other people. ""The RICOH THETA is a groundbreaking device for general consumers of all ages and all photographic skill levels," said Noboru Akahane, president of Ricoh Imaging. "Its unprecedented capability to capture fully spherical images, coupled with affordability and user friendliness, makes the RICOH THETA a tool that anybody can use to discover and share their powers of creativity. ""The RICOH THETA isn't just a big step forward in panoramic photography," according to Blaise Agüera y Arcas, Distinguished Engineer at Microsoft, and Architect of Photosynth. "It changes the nature of photography itself: You can shoot first and crop later, or share the full sphere including the photographer. It's an exciting product, and Microsoft is proud to be partnering with Ricoh by integrating support for the RICOH THETA in the Photosynth mobile app."